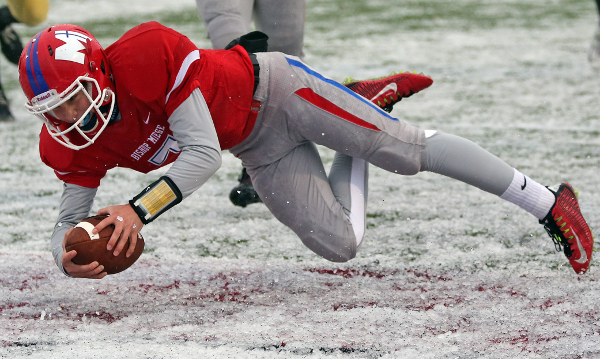 TOPEKA -- Not even rain or a frozen field could cool off Bishop Miege’s offense as they faced off against the Jaguars of Andover Central in the Kansas 4A Division I State Championship Saturday at Hummer Sports Park. The weather was the story prior to kick off. Temperatures hovered around freezing all afternoon, and participants endured a steady rain and an ice-covered field. After kick-off, however, the story was all Miege. The first quarter was dominated by the Stags’ star running back Dawson Downing. Miege took the opening kickoff and started feeding the senior immediately. Downing capped off the opening drive with a 10-yard touchdown, his first of three in the quarter and six on the day. The highlight of the quarter was Downing’s third touchdown. On the first play following a punt Downing took the handoff on a simple draw and burst through the line and was met by a trio of Jaguar defenders. Each one got a hand on Downing, but none were able to bring him down. After breaking free, Downing raced 79 yards to put his team up 21-0 near the end of the first quarter. If the first quarter was about the Stags’ running attack, then the second stanza was all about their defense. The Stags sacked Andover Central on fourth-and-goal and sophomore quarterback Carter Putz finished off a long drive, which included a fake punt, with a seven-yard touchdown. Bishop Miege then added two consecutive defensive touchdowns in less than 30 seconds. The first came on the ensuing kickoff as Central’s Darraja Parnell fumbled and senior safety Ray Vaca scooped up the loose ball and ran into the end zone raising a hand over his head as he crossed the goal line. Things went from bad to worse for the Jags on their next possession. Jordan Birch fumbled two plays later and Vaca was again in the right place at the right time to pick up the ball up and race 20 yards for his second straight touchdown. The lone bright spot for Andover Central came near the end of the half. Senior quarterback Peyton Huslig dropped back, surveyed the field, and launched a high-arching pass to the back corner of the end zone to Parnell who had gotten two steps behind the defender for the touchdown. After a missed extra point the halftime score was 48-6 Bishop Miege. After the intermission, the Stags’ defense picked up right where they left off. Miege picked off Andover Central on their first drive, then held on fourth-and-goal for the second time. Putz led his team on a 94-yard touchdown drive spurred by big plays from Cameron Clark and Jafar Armstrong. Putz threw his only touchdown pass of the day on a nine-yard strike to senior wideout Danny Murphy. With nine minutes left in the game Bishop Miege started subbing its seniors out one-by-one allowing each of them to receive a standing ovation from the crowd. Andover Central’s Jordan Birch punched in a touchdown late in the game making the final score 68-12. Rushing — Miege, Dawson Downing 26-231, Clark 10-64, Putz 7-36, Dylan Downing 1-30, Gray 1-0, Armstrong 1-(-1). Andover Central, Birch 23-136, G. Schoonover 1-7, C. Schoonover 1-1, Huslig 8-(-4). Passing — Miege, Putz 11-16-127-0, Gray 1-1-27-0, Armstrong 1-1-17-0. Andover Central, Huslig 8-28-132-2, C. Schoonover 1-1-4-0. Receiving — Miege, Murphy 3-46, Armstrong 3-30, Da. Downing 2-27, Gray 2-26, Schultz 1-27, Gleason 1-9, Winklhofer 1-6. Andover Central, Anthemides 3-67, Parnell 3-44, Taylor 1-14, Birch 1-7, Huslig 1-4.